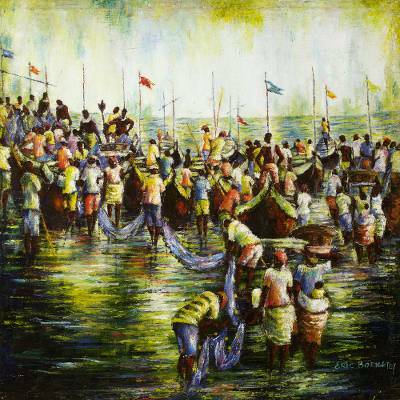 Signed Impressionist Painting of Fishermen from Ghana, "Fishing Folks I"
Fishing folk gather at the water's edge, setting off in boats to begin the day's work. Ghanaian artist Eric Oko Borketey finds great joy in returning to the fishing spots every day as he observes the fishermen and women hard at work. He paints this composition in the impressionist style, inspired by pointillism, where careful dabs of the paintbrush suggest shape and form. "I take my inspiration from the fishing folk and the markets. My father is a fisherman and my mother is a fishmonger." "I was born on February 2, 1956, in Nungua, a fishing community just outside of Accra, the capital. I had my early education at Nungua Anglican Primary and Middle Schools. "Between 1976 and 1979, I tried my hands on sign-writing. I then went to the Accra Art School to study painting. This took me 3 years. After that I went for a 3 month apprenticeship training. I was taught to use water-based colors like acrylic and gouache to perfection. I was also introduced to mosaic by a friend. "I started commercial painting in 1985 and I exhibited my work at the National Art Center gallery. In 1990 the arts coordinator of the Center, in association with some other artists, held exhibitions at the Golden Tulip Hotel in Accra. I later had my work exhibited at other galleries. "I love working with gouache. I take my inspiration from the fishing folk and the markets. My father is a fisherman and my mother is a fishmonger. Therefore it's not strange that I come up with such themes for my artwork. The unique culture of the North also interests me a lot and influences my work in several ways. "I use the palette knife for my gouache on paper. I use all kinds of strokes in my work. "I always paint in a happy mood. I believe that all of life is a struggle; every situation you find yourself in should be seen in a joyous light since we have to make the best out of every bad situation. "I sell to everyone who can identify and find meaning to my work. I've been married for 2 years. I don't have any kids as yet but I believe by the grace of God I'll have some very soon. "Naturally, I'm a cool person, very strict and frank. I therefore expect everyone to deal with me as I will deal with them. I like teaching, learning and listening to music. I'm learning to play keyboards."